Aneta was first introduced to yoga in 2005. Her passion for yoga grew and soon turned into a lifestyle. Inspired by knowledge beyond the physical aspect of yoga, Aneta became a student of yogic philosophy and graduated from a 500-hour Yoga Alliance Certified - Advanced Studies and Teaching training program through Yoga Pura in 2009. From interesting sequences to uplifting music, Aneta's classes are designed to push physical boundaries while cultivating a calm and centered mind. Aneta is passionate about living a healthy and well-balanced life, and incorporates various yogic practices and philosophy into her daily life, encouraging students to incorporate these ideals both on and off the mat. Aneta teaches Advanced Beginner/Intermediate Slow Flow Vinyasa and Gentle Yoga. Marion loves to inspire fitness everywhere! She was a lead cyclist on the University of California Berkeley Women's cycling team. In her home town of San Diego, she taught spin aerobics in spin studios and gyms, and later to military personnel at the Naval Base, Millington, TN while earning her MBA at the University of Memphis. An avid swimmer and prior master's coach, Marion competed in swim events in Japan. 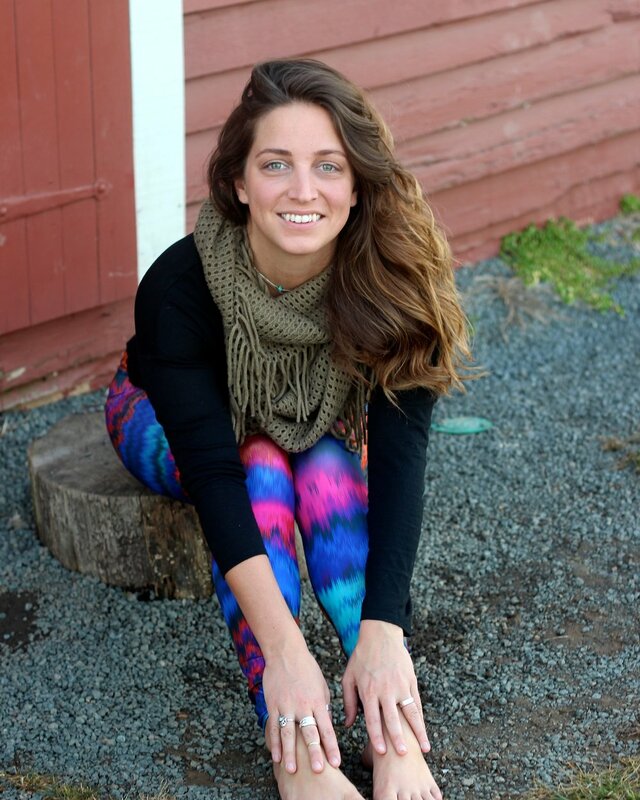 She is dedicated to her family and enjoys instructing barre and yoga. Marion is certified by Metropolitan School of the Arts and Yogafit (RYT200). She strives to maintain a high level of fitness and nutritional health while inspiring others to do so as well! Here at Breathe, Marion teaches All Levels Slow Flow, Pre-Natal Yoga and Core Barre. As a former high school runner, swimmer and current gym membership drop-out, Stacy began her yoga practice as a way to re-connect with and be more compassionate to her body. Stacy sees yoga as a personal journey that brings a sense of strength, balance and mindfulness into everyday life. Her feeling is yoga should be fun as well as informative and body positive. Our mats are a place of safety and non-judgment, both of ourselves and those around us. Stacy strives to make sure that at the end of every class students feel better than they did when they walked into the studio. She loves watching each person take the knowledge gained in each session and then expand on it and build their own personal yoga practice. Stacy currently teaches some of our Early Bird Yoga classes. She is 200-hour RYT certified and also has certifications in Divine Sleep Yoga Nidra; Gentle and Chair Yoga; and Gentle Yoga for Low Back Care. She is also certified in SAIL and MoB which are programs designed to help seniors maintain balance and stability. Erin’s yoga journey began as a supplement to running. What she found was so much more. It made her a stronger runner but the real nugget was that yoga taught her how to listen to her body about acceptance and forgiveness, gave her peace in her heart, and taught her how to let go (and that letting go is not giving up). Erin’s style of teaching is upbeat with a wide variety of musical inspiration. She hopes to share her love for yoga with all of her students and to encourage them to breathe deeply, believe in themselves, trust their body, and feel at peace on and off the mat. Erin teaches All Levels Open Flow. Amy's yoga journey started in 2002. Her love of yoga inspired her to gain a deeper understanding of this life-changing practice. She feels honored and blessed to share her passion for yoga in a safe and loving way, encouraging self-examination and relaxation while promoting flexibility of the body and mind. She firmly believes yoga is a wonderful way of teaching people how to gain a fresh perspective by helping them step away from the rigors and distractions of everyday life to rejuvenate both body and mind. Amy completed her Teacher Training in June 2016 and her 200-hour RYT in 2017. Amy teaches Hatha Yoga. In 1999 Janet attended her first yoga class after hearing about its benefits in relaxation. By the second time through the door she was hooked and has been practicing ever since. Not only has it brought her relaxation but so much more balance, strength, flexibility and focus. Janet began her yoga journey in the Iyengar style, with a primary focus on alignment. Today she not only teaches in the Vinyasa style, linking movement to the breath, but also in restorative and hatha yoga. Fusing styles in her classes leads to a well-rounded practice. Her goal in every class is for you to leave feeling better than when you walked in the door. Janet is Yogafit RYT-200 certified, 2011. She teaches Hatha Yoga and Yoga Stretch. Petya has been in the Health & Wellness field since 2004, practicing meditation for over 10 years. Her passion for teaching meditation began after going through a rough path in her personal life. By focusing on helping people improve emotionally, Petya realized her own life was getting back on the right track. Her positive energy and calm thoughts were in the center of it. Petya is a certified Reiki Master and in training for Master Health & Wellness Coach. She teaches meditation, chakra balancing and crystal healing. She is versed in Essential Oils and aromatherapy, blogger and founder of Mindful Beauty Advisor. Her motto is “Take time to do what makes your soul happy!” Petya teaches our Guided Meditation classes. Lana began practicing yoga in 2010 when she suffered from debilitating back pain She found relief in yoga when painkillers, muscle relaxants and chiropractic treatments were ineffective. Lana wants to share the same sense of joy, inner peace and physical well-being she enjoys from her yoga practice with her students. Lana teaches Hatha Yoga, and Yin Yoga. Shannon grew up an Air Force brat, living throughout the US and was an avid swimmer in high school and college. After her second child was born she decided she needed to incorporate fitness back into her life. In the fall of 2013 she took a Piloxing class at the gym and became hooked on the fusion of boxing moves, the Pilates-inspired core work and the fun of dance. After a few months of taking the classes she became a certified instructor. In the fall of 2014 Shannon became certified in Piloxing Barre, which fuses ballet-inspired Pilates moves with a cardio boxing push to achieve a better body balance. In 2017 Shannon became Peak Pilates Certified. Currently, Shannon is teaching Basic Pilates, Advanced Beginner/Intermediate Pilates, Mixed Level Pilates, and Open Barre Workout. Sabrina has been into all types of fitness since the early 90's. After being introduced to Pilates by her mom, Sabrina was hooked and started working to become an instructor. Sabrina is Peak Pilates Comprehensive Level 1 Certified and Core Barre certified. In the fall, she will have finished her Peak Pilates Comprehensive Level 2 certification. Sabrina is also working on completing a special certification in Osteoporosis. She has studied under many master instructors and works with a master instructor weekly to continue learning and growing in her Pilates practice. It's not just a form of exercise for Sabrina, it's a way of life and she teaches her clients how Pilates can help with recovery from injuries and/or prevent these injuries from occurring later in life. Sabrina teaches Basic Pilates, Mixed Level Pilates, and Barre/Pilates Combo. Elizabeth has taken training in foundational Yoga techniques, Viniyoga and Yoga for trauma victims. Her personal practice and teaching focus is on using Yoga to encourage healing, developing equanimity and enhancing longevity. Elizabeth lives in Burke with her husband Chris and their three Chesapeake Bay Retrievers. Elizabeth teaches Early Bird and Restorative Yoga. Binita began her yoga journey in 2010 when she stumbled upon a yoga class at her work gym in Richmond, VA. She started taking yoga on a routine basis and yoga slowly became a daily part of Binita's life. Today it is a passion she enjoys sharing with others. She completed her RYT-200 hours of training and is trained in multiple lineages of Yoga to include Vinyasa, Asthanga, Dharma, Power, and Hatha. Binita feels that Yoga can do wonders for a person if practiced with full dedication, focus, and commitment. Yoga is not something you do, it is something you feel. Her motto in life is balance and she is thankful Yoga helped her find that balance mentally, physically, and spiritually and hopes to help others find the same. Binita is teaching Advanced Beginner/Intermediate Vinyasa, All Levels Slow Flow and Adbvanced Beginner/Intermediate Slow Flow. Samantha (200ERYT/YACEP/RSS) is a service-based, trauma-informed yoga teacher with a passion for holding space as clients navigate their bodies, minds, and spirits in an inquisitive way. Her lineage is kunga yoga (kunga is kinyerwandan for “to serve, reconcile”), integrating breathwork, meditation, ayurveda, and assisting as tools for a path of self-inquiry shifting to creative expression. Her offerings often include sound, art, writing, and other modalities of experience. Samantha believes your practice seeks to meet your energy and needs where they are every time you practice. Her goal is providing skilled guidance and support through the shared time, holding safe space as you dive in! Christie has been practicing yoga for over 6 years and has taught as a certified 200hr Yoga Instructor to students of different skill levels and ages for over 4 years. She has experience in different movements from parkour (a combination of movements to get from A to B) to dance to martial arts. Christie is co-leader of DC Area Women's Parkour and will complete her ADAPT Parkour Certification by the end of the summer 2018. In her classes, expect constant movement with the focus of connecting the movement with the breath. She is always encouraging her students to go a little further than they think they are capable and believes that with an open mind, they can accomplish anything. Christie teaches Functional Strength/Core and Advanced Beginner/Intermediate Vinyasa. Alessia is originally from Italy and trained in classical ballet for 10 years. She thought about becoming a fitness instructor but could never find the right discipline until she discovered Barre with its connection to ballet. Alessia is a Barre Above (TM) trained instructor (May 2017) and her barre classes deliver a fusion of ballet, pilates, yoga, and strength training. Alessia is teaching Barre Body Workout. Athena began her fitness journey in 2002. She completed her group fitness certification in 2010 and in 2013 completed 200 hr yoga training. Athena is also certified in Spinning, Mat Pilates, and Jazzercise. Athena's goal is for students to have fun, being energized and challenged while still loving every minute of the journey. Athena teaches Total Body Conditioning, Intermediate/Advanced Vinyasa, All Levels Vinyasa, and Hatha Yoga. Annie began her yoga journey in 2008. That same year, she graduated from the University of Tennessee and became a teacher of Elementary School General Music. Annie has combined her passions for teaching and yoga by participating in the Teacher Training Program at Sun and Moon Yoga. Annie hopes to bring wonder and whimsy to the practices of her yoga students, young and old alike! She teaches our Kids Yoga classes.